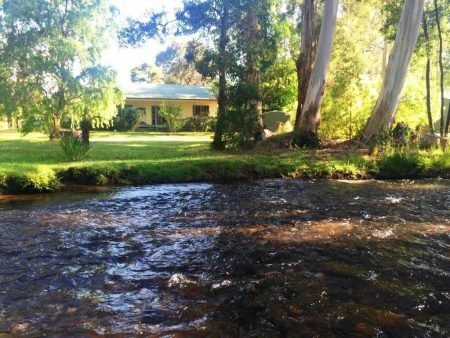 River Cottage is a wonderful fully equipped home with absolute river frontage backing on to the Steavenson river, in a magical part of the world, 1.5 -2 hours from Melbourne. The house is a perfect place to relax and unwind, enjoy family time, or engage in the many activities in the region – fishing, waterskiing at Lake Eildon, downhill and cross country skiing, visiting the wineries in the Yarra Valley, walks in nature by the rivers, mountains and waterfalls, mountain biking or horse riding, swimming, hiking in the Cathedral Ranges and surrounding region, writing or painting, or simply relaxing and unwinding, surrounded by nature. It is a 2 minute drive to the Buxton township and 10 minutes to Marysville. This home is full of light, with open plan, cosy lounge and dining with a wood heater, reverse cycle heating and cooling, and an excellent kitchen. The clean and tidy two bedroom light filled home has a main bedroom with a queen bed, second bedroom with queen bed and single bed, and bathroom with shower and bath. It has an excellent fully equipped kitchen. The house has a huge level front and back garden, with the rear yard overlooking the river.